Mack Rides recently completed a major spinning coaster/dark ride installation at Universal Studios Japan. Space Fantasy features an eye-watering hourly capacity of almost 2,000 and is packed with exciting features and fun theming. 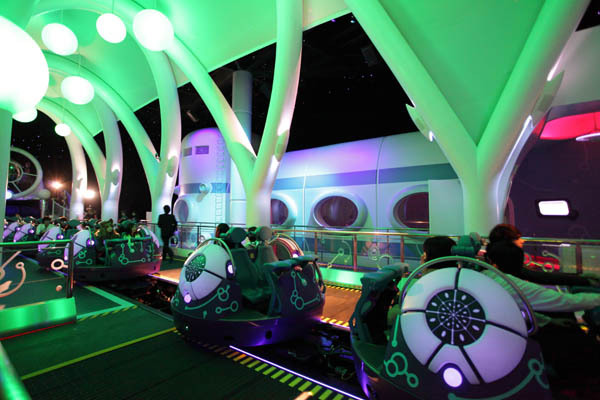 Replacing ET Adventure, Space Fantasy uses a similar ride system to Sierra Sidewinder at Knott’s Berry Farm in California but comprises no fewer than 19 eight-seater trains, each train comprising a pair of four-seater spinning cars. Universal Studios Japan, located in Osaka, is the busiest non-Disney theme park in the world, so a large capacity was essential. The new ride accommodates up to 1,920 passengers an hour. The ride comprises 595-metres of track, and travels at a maximum speed of 11 metres per second, giving a 275-second ride time. The cars can spin fiercely when required, but a friction wheel lifts the gondolas during the dark ride scenes. As with other Mack dark rides, a continuously moving platform speeds up the loading and unloading process. 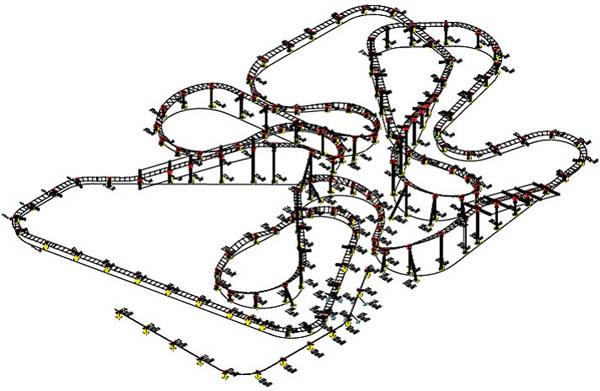 The track has a maximum height of 7 metres and in total there are three friction drive lift sections. These were chosen in preference to chain lifts as they are comfortable and don’t produce much noise, an important consideration for a ride inside a building. “The biggest challenge was to integrate the track layout to Universal’s wishes inside the existing building,” notes Mack Even. As passengers travel through the ride, LEDs light up in a variety of colours on the side of the cars and three speakers in each seat provide a rich soundtrack. Additional effects inside the ride include projected star explosions and the fire of the sun. The Space Fantasy storyline begins on planet Earth, which is shrouded in darkness. Realising that the power of humans is required to restore life into the Sun, the Solar Princess Cosmia calls on guests for participation. On their journey travellers encounter frozen voids and dusty nebulae en route to the sun, navigating around stars, comets and the planet Saturn with its giant rings. The solar shuttles eventually drift into a cluster of gigantic tumbling asteroids before being sucked into a cloud of billowing stardust. Riders are transported through the stardust to the orbit of Mercury where just beyond the first view of the dying Sun is apparent. The solar shuttles then rocketing toward the sun as passengers fulfil their mission from Princess Cosmia and become heroes. Space Fantasy is not Mack’s largest spinning coaster to date. That honour goes to Euro-Mir at Europa-Park, but thanks to the new controlled car movements and added effects, it is probably the German’s manufacturer’s slickest installation yet.